This post is dedicated to my son, with only pics of him from the 4 week backpacking trip. Were it not for him, I likely would have never seen China. A tall, mid-western young man in China speaking fluent Mandarin through a bit of a Texas drawl deserves his very own post. 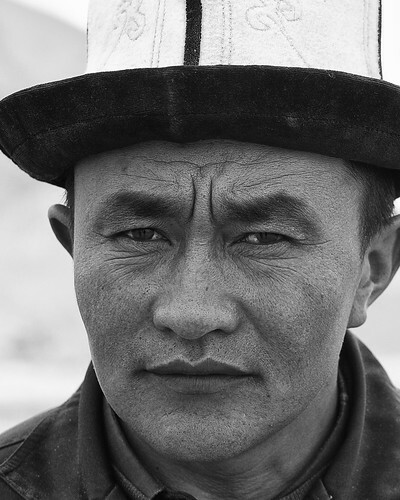 He paid the price to live in China for a year-and-a-half to learn the language. 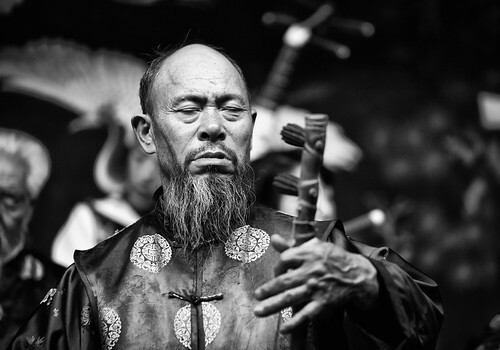 He lost 100% of his hearing in his right ear 3 weeks after arriving in Beijing, which is tragic enough, but he’s a musician and was attempting an almost impossible task in the learning of a tonal language. He knew no one, couldn’t speak the language, was completely alone and yet weathered the event, triumphing over all the barriers in the end. He’s said since that he so wanted to come home, but he stuck it out. Maybe with a stem cell miracle someday, he’ll regain the hearing. This trip, the memories, the photographs, journal entries, public stories, private stories (that we’ve sworn to the other to never tell), the fantastical peregrination would not have been possible without you. While I’ve enjoyed my day in the sun from the attention garnered from my documentation of the trip on this website, the writings, the photos shared with anyone and everyone, the ooohs and aahhhs from friends and family, it all really belongs to you. Thank you for what you’ve given me — the gift of a lifetime. P.S. I’d travel with you again, anytime, anywhere, for any length of time. And I hope that someday, we can again. 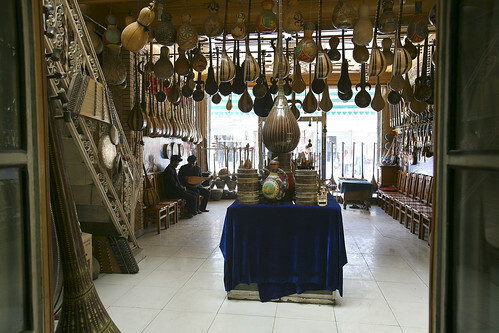 We made quite a spectacle that day traipsing to the Kashgar post office with my son carrying the beautiful Dutar, the proprietor carrying packing supplies, the helper carting a large wood box fitted to the instrument for shipping, and me. Two hours later, my son handed over the carefully packed instrument to the lady behind the postal counter. The Dutar arrived home before I did, completely intact. My son is a musician -- a talented guitarist. While I love to tell the story of him picking up my red Fender at a young age and never putting it down and of turning him onto Stevie Ray Vaughan (which he says changed his life LOL), the guitarist he is today is solely because of his tenacity in the pursuit of a passion. May your next instrument be that Taylor of your dreams! Skipping rocks on Karakul Lake just off the Karakoram Highway near Pakistan. A couple we met at the restaurant in Lijiang. They loved my son and wanted to party the night away with him. Even he was tired by this point and chose instead to call it a day after the early dinner we shared with them. 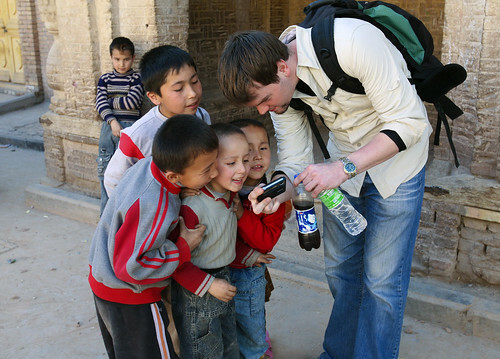 The Tall Midwesterner with the Digital Camera was a hit with the kids! The Tall Midwesterner got a lot of stares. He'd gotten used to it by the time I came over. With David, the Australian, whose contact information I lost before getting home. If anyone seeing this knows David, please tell him to contact me through this site! Self portrait after we'd parted in the Beijing airport. I was heading home to the U.S. while he still had several months to go. We were both sad -- I cried as the escalator took me to the tram. This is a photo no Mother wants to see. This next set of photographs are ones taken either by him or of him during his stint in China before and after I visited. They were worthy of being included here. Taken on one of his Solo Road Trips. Like Mother, like son! Personal Journal Entries: I wrote a lot on this trip — an entire Moleskine was filled with thoughts, simple here-to-see-this-and-there-to-see-that, and a lot of reflection. More than I thought upon reviewing the entries. And more of it negative than I thought I was feeling at the time. The trip was physically challenging. Four weeks of carrying heavy backpacks, staying in hostels, eating sparsely, utilizing squatter toilets, unable to drink the water, wearing dirty clothes, cold at times, constantly struggling with the language barrier, it was the adventure of a lifetime and one of great personal insight. Throughout the month I struggled with the lack of smiles and the absence of small kindnesses. Being born and raised as a Southern gal, a ready smile and a certain degree of helpfulness has been bred in. Just prior to this incident, I’d written: “…David, the Australian, said he was noting in his journal all the kindnesses directed towards him. He is a better human being than me. And his journal will be far scarcer than my own for that.” LOL! 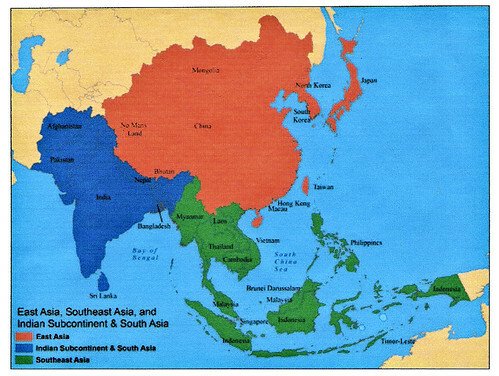 China is known as Zhongguó in Mandarin. The character zhong means “middle” or central; the letter, guó means land, kingdom or country. An appropriate English translation would be “middle kingdom”. Being transported from China’s Wild West to China’s interior involved my first sleeper train adventure. Fourteen hours of cramped existence, in a top bunk at that, from Dunhuang to Lanzhou was initiated by an “incident” in the train station at Dunhuang. It’s a Chinese phenomenon apparently, one with which everyone who’s traveled to China is painfully familiar. It’s the “stampede to cut in line” or let’s-push-and-shove-’cause-we-might-not-get-a-seat-even-though-we-have-a-reserved-ticket syndrome. Having a 50 lb. backpack strapped to my back didn’t help my balance. Had it not been for the crush of others, I would have taken a sidelong dive from the platform. Isn’t this what we adventure travelers live for?! The momentary fear passed quickly, exhaustion set in making it a quick night, and we disembarked into an exquisite land of temples, pandas, limestone formations, glorious music, and Sichuan food. Chengdu, Sichuan Province -- 14 days after my return home, Chengdu was hit by a 7.9 earthquake -- the worst in 3 decades. Tens of thousands died. Much of what we saw may have been leveled. 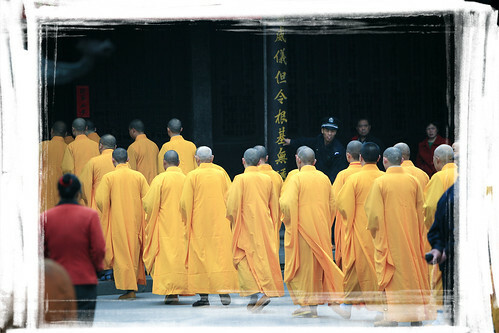 The Monastery of Divine Light is 18 km (about 12 miles) north of Chengdu and is an active temple. Grand Buddha, Leshan, Sichuan Province. 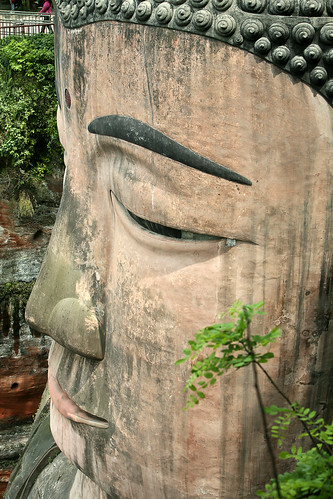 The 80 year project to carve a Buddha into the cliffs of Leshan in 713 A.D., resulted in the largest Buddha in the world. Sitting in an alcove of sorts, he guards boatmen at the confluence of 3 rivers. A World Heritage Sight, he's 71 meters high, 233 feet. His ears are 7 meters long! 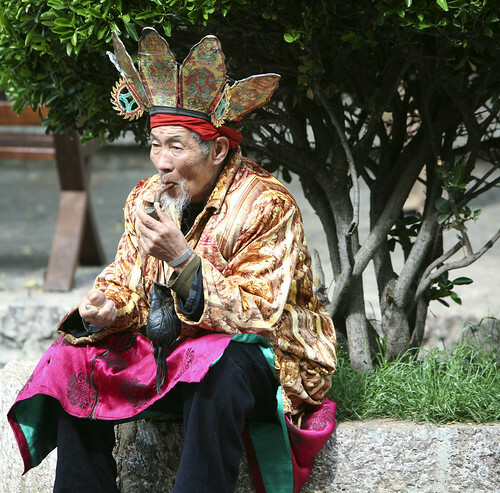 Lijiang's old town is a World Heritage Sight and has been the base of the 286,000 strong Naxi tribe for the last 1400 years. 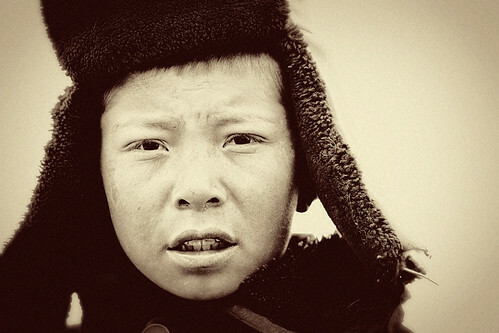 They descend from ethnically Tibetan Qiang tribes and lived until recently in matrilineal families. 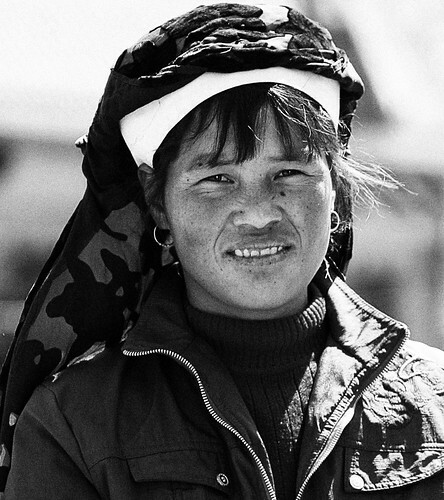 There are strong matriarchal influences in the Naxi language. Nouns enlarge their meaning when the word for 'female' is added; conversely, the addition of the word for 'male' will decrease the meaning. For example, 'stone' plus 'female' conveys the idea of a boulder; 'stone' plus 'male' conveys the idea of a pebble. Guilin, Guangxi Province. The karst topography/lime formations along the Li River made me think we were floating down a stream running along the ridged backs of ancient dinosaurs. At any moment I expected our boat to be catapulted above the water as one decided to come up for air. The day the picture below was taken was dreary. The light was drearier. So I played around with Photoshop and finally achieved a result with some degree of appeal. And this depiction is actually a decent representation of the images my mind registered that day. Actually China wasn’t even on the list. But the adventurous son upon graduation from OU, decided to pursue his fledgling Mandarin. In China. So when the opportunity arose for him to take a month off from school and my schedule became such that a month was possible as well for me, we began to plan. Bigger backpacks were purchased. Squatter toilet techniques were reviewed. Immunizations. Visa. Maps, maps, and more maps. We nixed all the big cities. If I’m going to see something, I want to SEE something. Something is not the interior of a city hotel where everyone speaks English and really, you could close your eyes and sense you were in any city of the U.S. No. What’s the point? I’m still young enough (recall the ad nauseum part? the women in my family have all been teenage mothers, including myself) to want to experience the places I go. That means hiking as opposed to a tour van, being exposed to uncomfortable physical conditions and intermingling with the population. I figure I can go back someday when I’m too old for REAL exploration and see Beijing, Shanghai, HongKong. And when I get really, really, really old, I’ll shop. Until then, exploration means occasionally being dirty, tired, and hungry, and some amazing captures on “film”. For this trip, my son asked if I’d be willing to blend in a bit more. No one believed I’d do it. Well who can resist a huge dare? A lifetime of long, blonde locks were carried away by a broom and replaced with a dark brown color. My son didn’t recognize me at the Beijing airport! This ain’t Beijing. It’s on the opposite side of the country, as far away as you can get from the major Chinese travel destinations. And if you managed to get here (a feat my friend), without knowing where you were headed you wouldn’t recognize it, or anyone living here, as being associated with China. Machine guns and outdated airport equipment were in our face as we timidly looked around the tiny Kashgar (Kashi) airport in XinJiang Province. Not far from Afghanistan or Pakistan, the security was tight. In the Urumqui airport they’d flagged my backpack and after removing every single item comprising its 50+ lbs., determined the X-ray machine had not liked the looks of my water filter. The carbon filter looked menacing I suppose. Got to keep the water filter, but not before lots of time was lost trying to explain what a water filter is. My son’s fluency in Mandarin was not completely useless, just almost (they speak Uigher here). I didn’t want to look anyone in the eye for fear Urumqi had called ahead regarding the water filter incident. They hadn’t. We spent about half of our 4 weeks in China in the West. It is still marked as a No Man’s Land on a few maps. We embarked from the airport into a land that time has forgotten. 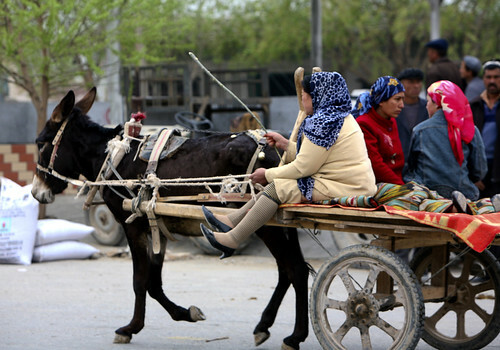 Kashgar is a time warp that could just as easily have been the set of a Star Trek or Twilight Zone. It was indeed just as exciting as stepping through that portal opening. The Han Chinese are minorities here. Uigher is the language. The people (Uighers, Tajiks, Krygyzs, and Uzbeks) seemed the happiest and were indisputably the kindest we encountered during 5 weeks touring the backcountry of China. 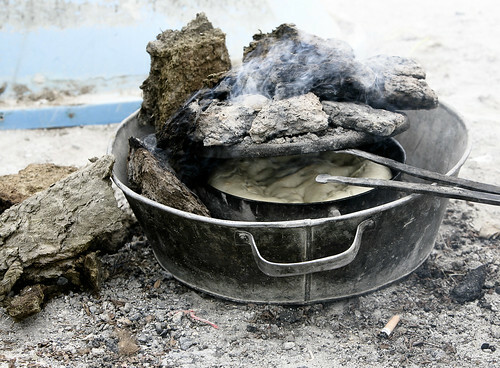 Yak Dung Bread. It was served dipped in Yak Milk Chai Tea by the lady of the house (above). It was delicious! Located in the Taklamaken desert, homes of mud and grass have stood for centuries. Sand storms are frequent. Coming from Beijing, or any of the larger cities, you see what you think is the same smog choking the air. But if you’re so lucky to find a shower, you realize once the water hits you, it’s not smog, rather sand. 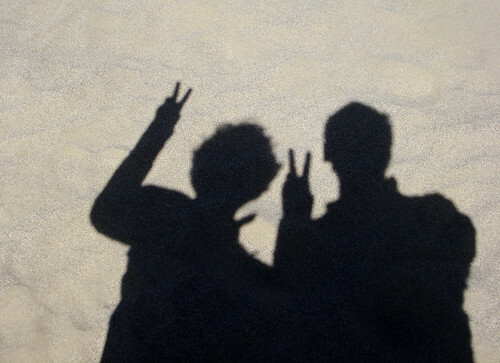 And regardless how new something might be in XinJiang, the sand ages everything quickly. Including humans. Only in their most recent version did Lonely Planet make any mention of this portion of the Great Wall. My son had heard about it and so we asked around. A guy offered to drive us – 4 hours one way outside of Dunhuang and worth every shockless inch. My first Great Wall experience was at the section of the wall few people get to see. In the middle of the desert I glimpsed it. The magnitude of what I was seeing with my own eyes in the the middle of a wasteland moved me to tears. The Westernmost section of the Great Wall lies in the Gobi desert, is still VERY discernible, very viewable, and very mind blowing. It’s unrestored remnants from 101 B.C. were impressive – no stone work, just mud, grass, and small stones. The joy at sharing this sight with my son will be with me always. She was a yurt dweller off the Karakoram Highway not far from the Pakistan border. It was impossible to tell her age. Brightly (and warmly) dressed she had the features of a beauty queen, the movements of a model, and the smile of a joyous existence. Yet she was gathering water that weighed approximately 10 pounds on each shoulder. Then she balanced it with practiced skill. Having some distance to transport it back to her home meant any spillage would have been a tremendous loss of time and effort. Dunhuang is southeast from Urumqui in the province of Gansu, just south of Mongolia. Also on the world’s first information superhighway, the Silk Road, Gansu is a treasure trove of Buddhist paintings and sculptures, and the Buddhist grottoes of the Mogao Caves. The arid land and harsh climate has made the land barely inhabitable. 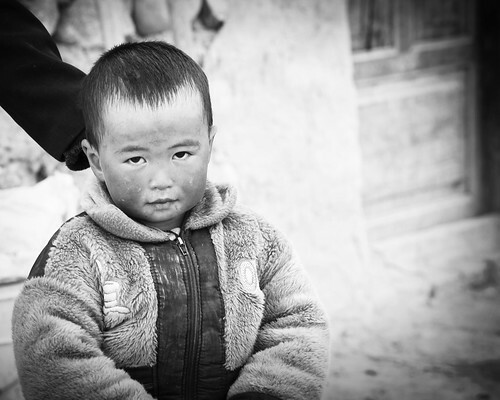 As such, the Gansu Province is one of the 5 poorest provinces in China. Dunhuang may be poor, but when we pulled into downtown in a “taxi”, we were instantly transported from weary travelers to starry eyed tourists. The town is alight at night with magical colors and we were gratefully rejuvenated by the sight. The light of day replaced the magic with a sobering reality. Yet even that meant 3 days of adventure we’ll never forget. This picture of grottoes is on site of the Mogao Caves. There were no cameras or recording devices of any kind allowed inside the gated and heavily guarded caves. Filled with art and sculpture of a quantity and often of sizes that strain our modern brains to comprehend, the caves were exquisite. I’ve dreamed about what I saw in there several times since arriving home. Impossible to describe, breathless to behold, it was one of my favorite ancient sites. To quote Lonely Planet “The Mogao Caves are, simply put, one of the greatest repositories of Buddhist art in the world.” At its height the site had 18 monasteries, 1400 monks and nuns, and numerous artists, calligraphers, and translators. Generally agreed to have been founded in AD 366, the collapse of trade after the Yuan dynasty left the 1700 meters of grottoes and millennium of art untouched for centuries as the Gobi desert took hold. It was only in the 20th century that the massive, priceless troves of art and remnants were rediscovered. Having returned from 4 weeks backpacking China with a thousand photographs, a large Moleskine filled with a multitude of entries and anecdotes, the story of it all is only now being synthesized by my brain. I’ve attempted to put the pieces together before, but could never quite get my arms around them. No amount of effort could pull them together into something cohesive. Upon my return I swore I felt nothing. Exhaustion, jet lag, the weariness of the wear and tear of hard travel in a hard land, combined to send a perfectly targeted trajectory of flack to my brain, effectively deflecting the depth of impact upon my spirit this journey had made. In truth I felt so much, so strongly, I was paralyzed by it. Until now. Until friends and family started asking me if I was going to ever share my experience. Yes, is the answer. Beginning with this post, I’ll be continuously documenting the trip until I’ve got it all out. I’ll start by sharing mostly photographs, easing into more of what I’ve written as we go along. Doug Henderson, a renowned commercial photographer/graphic designer, instructed my first Photoshop course. 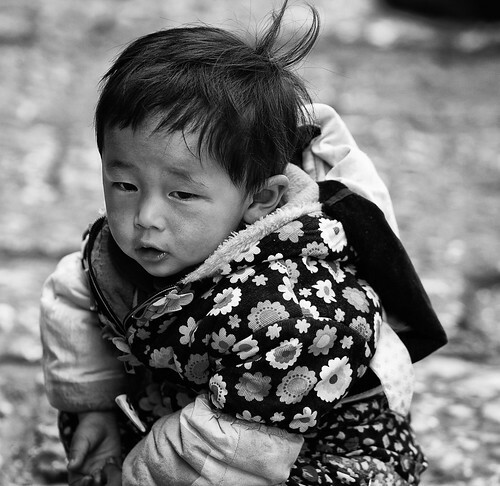 His photography wrings emotion from my soul and we happen to share a similar view of photographing people. His perspective is eloquent, so I lifted it — hope he doesn’t mind. “I think the average person is beautiful. I don’t see any reason to comb a little kids hair or tell them to smile. I see no reason to try to make an old person look young again, or to make a working man look like an executive.” If I ever decide to be photographed, he’ll be the person I ask. In my own words, I find faces moving. Uigher Children. 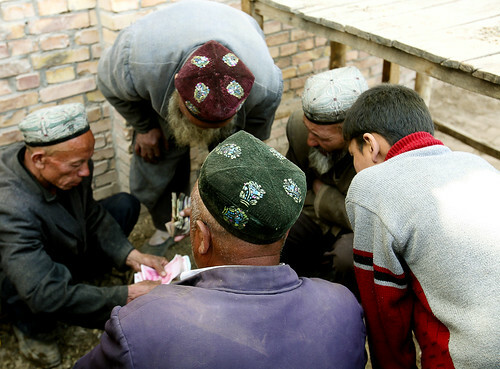 Kashgar, Xinjiang Province. Uigher Girl. 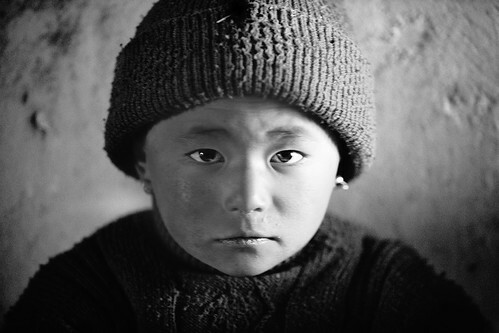 Taken while we gathered in her parent's yurt on the Pakistan border for Yak Dung Bread and Yak Milk Chai Tea. 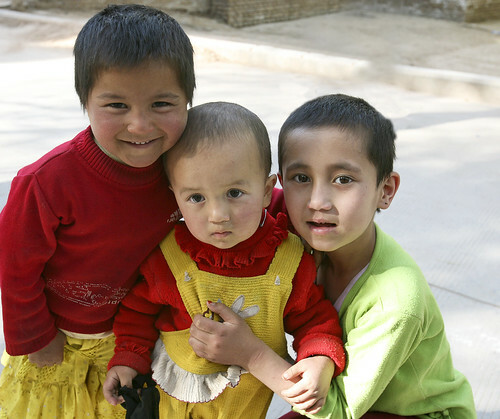 Xinjiang Province. Woman of the house (yurt). 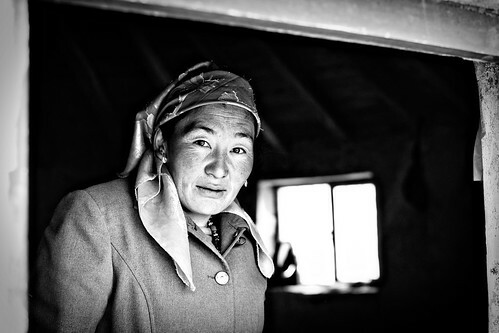 Kyrgyzstan Woman.Xinjiang Province. Ten Feet of Hair and really heavy earrings. In a village called Huangluo, (not far from Guilin in the Guangxi Zhuang Autonomous Region), for those of the Yao Nationality, long hair is a local tradition. 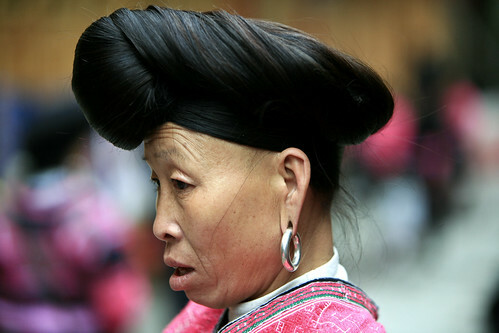 All the Hongyao women can only cut their hair at 16 years old, symbolizing the fact she is an adult who can look for a lover. The hair cut off should not be thrown away, but is rather kept by the grandmother. When the woman marries, the hair is made into an ornamental headdress and brought to the husband’s home as a souvenir. This boy captured my fancy. You'll see more photos of him. 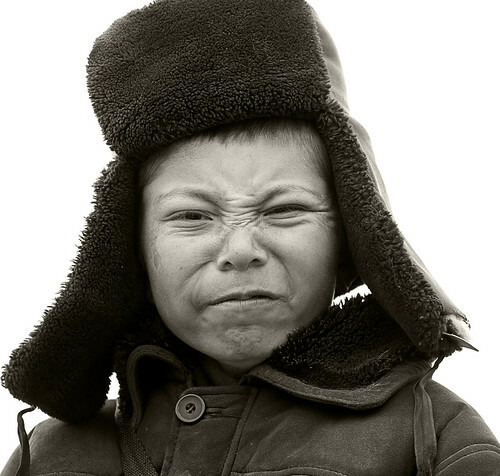 His face and demeanor was of a shy sweetness of heart, hardened by the environment. He had all the vitality of youth but eyes that betrayed his age. Uigher, Xinjiang Province. Leshan Grand Buddha. Sichuan Province. We were the first Americans the proprietor had seen. His son came in from school and he asked him to play while we ate. The boy graciously agreed. The instrument is an Er Hu (thank you son for recalling that). Gansu Province. Not all faces are human (Leshan Buddha) but all faces in a foreign land are foreign. Including our own. 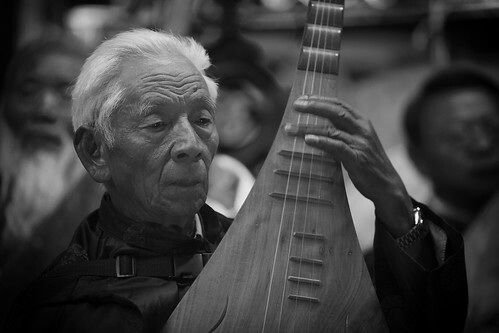 Naxi Orchestra Musician. Yunnan Province. It was cold. He had the sniffles. Xinjiang Province. Hands of an Artist. 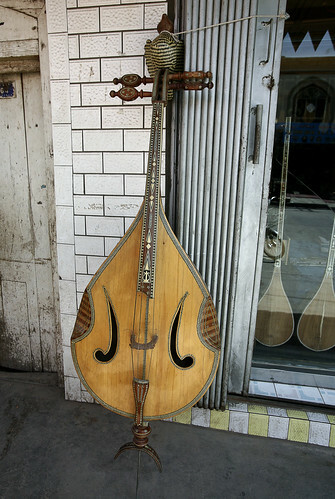 Naxi Orchestra. Lijiang. 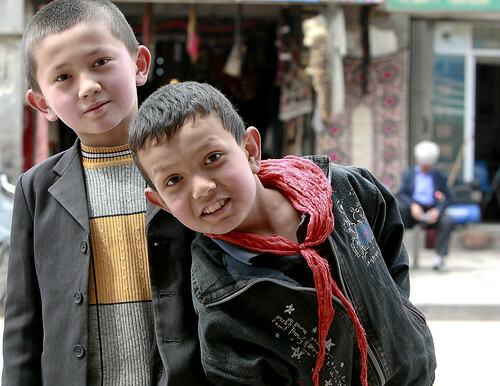 Uigher boys, Kashgar, Silk Road in the Xinjiang Province. I wanted to bring him home with me.